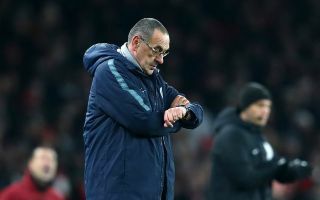 Journalists seemed to agree that Jorginho is a major weak-link in Maurizio Sarri’s Chelsea side after their 2-0 defeat to Arsenal on Saturday evening. The Italy international initially shone when he joined Chelsea from Napoli in the summer transfer window, having also been one of the top performers under Sarri at their old club in Serie A. However, it now seems Jorginho is being found out in the Premier League, with Martin Samuel and Henry Winter agreeing on Sunday Supplement that Sarri needs to change his tactics so he’s not building everything around the 27-year-old. Talented as he may be, it does seem odd to make him a focal point in a side also containing world class players like Eden Hazard and N’Golo Kante, both of whom have had to adjust their games under Sarri this season. Kante in particular looks far less convincing in a more attack-minded midfield role, and it’s hard to understand Sarri persisting with this tactic just to get Jorginho in his preferred role, with the Frenchman surely needed deeper. “The headline is ‘Sarriball is fantastic’ says bloke called Sarri,” Samuel told Sunday Supplement, as quoted on Sky Sports. “It doesn’t necessarily mean it’s fantastic for everybody. It isn’t fantastic for Kante or [Eden] Hazard. “The guy it all has to rotate around is Jorginho, who doesn’t look good enough for that, certainly not in the Premier League. “It seems to be a lot quicker than Serie A was for him. Arsenal swarmed around him yesterday. Sarri was basically saying ‘Arsenal wanted it more than us’ but their midfield was superb. “They swarmed around Jorginho and they swarmed around Chelsea’s midfield. You’ve got Jorginho who, going into the game, the statistic was 1997 passes, creating 15 chances and zero assists. Winter added: “The other thing apart from sorting Hazard out [returning him to the left wing] – which the Higuain issue should sort out – is N’Golo Kante. “We’ve seen Kante at Leicester and when he won the title at Chelsea; we voted him footballer of the year. He’s at his best when he’s played deeper.